LEGO® storage is important. Done badly and you will spend your days finding LEGO elements in the strangest places, dealing with frustrated kids telling you for the third time that they can’t find the grey thingumy-jig and dreading the day your admins ask you to update the school’s asset register. Done correctly and your students will quickly find the elements they need, allowing them to stay focused and concentrate on addressing the challenges at hand. LEGO Robotics is an expensive investment that you want to get the most out of. You want to use that resource efficiently as well as being able to account for it all easily. 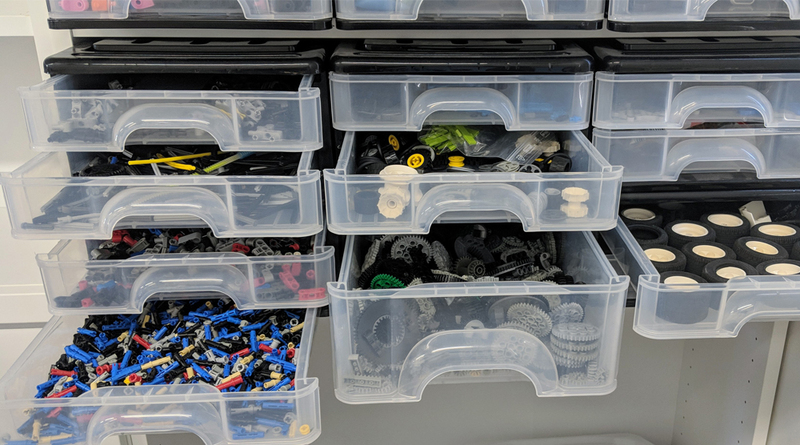 As schools’ robotics programs expand and they acquire more kits, they often find themselves overwhelmed with the amount of LEGO they have available to their students. Kit-based: Keeping the kits in their original boxes, without mixing up any of the elements. Part-based: Sorting the LEGO into separate containers, based on the function of the part. In reality, there is a continuum of options that span these two approaches and many schools fall somewhere in the middle. Keeping the kits in their original form. All the elements for a kit stay with that particular kit. As students build their robots up, they keep the robots with their original boxes and only ever take elements from these boxes. Often schools will ‘sign out’ a robot kit to a group and they then have responsibility for the kit for period of the robotics activity (anywhere from one day through to one semester). It is also common for schools to label the EV3 brain with a number or name, and name the storage box with the same identifier (I’ve seen lists of famous robots, superheros, scientists etc to name their robots). A label maker is invaluable for this! Pros: There is a level of accountability, where students must be able to show that all pieces are returned at the end of the project. This makes it easier to then redistribute to the next group coming through. The boxes are easy to stack and can be put away in cabinets/cupboards to be locked up. Cons: It is time-consuming to count back in all the parts, especially the small parts. There is then the question of what to do if a kit comes up short? Large pieces (Brains / motors etc) will need to be accounted for, but it is often not worth the hassle to chase up a few friction pins and bushings. 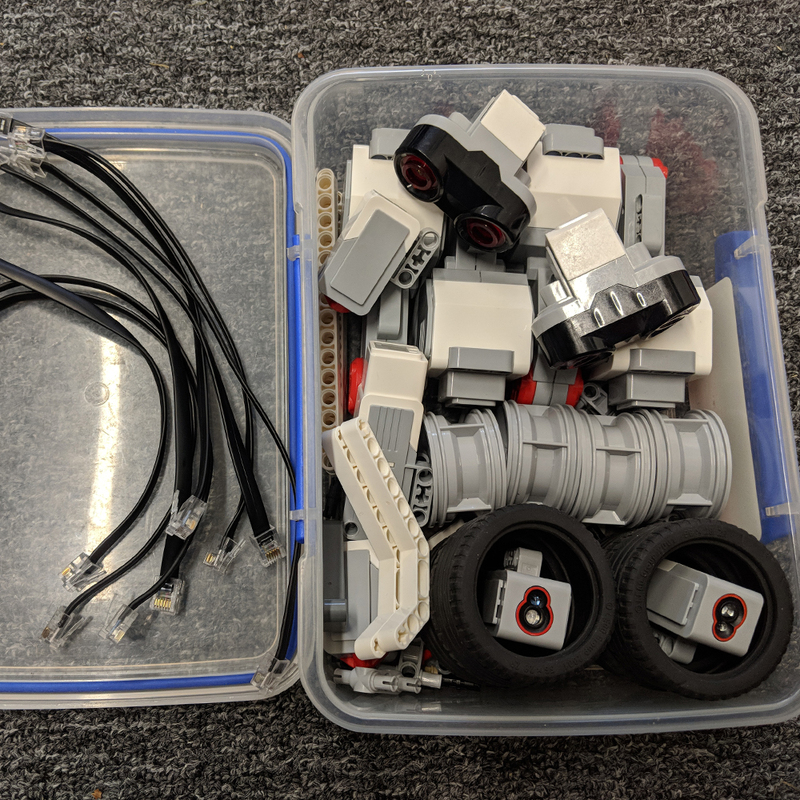 Some schools use things like the EV3 Extension kit as a ‘spare parts’ repository to bring their main kits back up to completeness at the end of each project. Robots are generally stored with their boxes (either inside or on top) to keep track of everything. It is easy to see if there is a robot missing from the top of one of the boxes. All the elements from all the kits are combined and then separated out into similar parts, e.g. a bucket of gears, a bucket of beams, a bucket of friction pins. Usually the larger, more important (i.e. expensive) parts are still signed out (e.g. EV3 Brain, motors sensors etc). Students are then able to collect the elements they need to complete their robots as required. The level of sorting can vary; some schools will group like-minded parts together e.g. all the connectors in one bucket. Others will sort every single element into its own storage location. Pros: Opportunity for more creative building. Students are not restricted to just the parts they have in a single kit, e.g. if a student needs a specific part to complete a mechanism, rather than being told they can’t do it because of resource limitations, they can just grab an ‘extra’ element to finish up. Clean-up and sorting is a lot faster, as it’s easier to put ‘all the friction pins in the buckets’ as opposed to ‘56 friction pins in each kit’. Cons: Inevitably there will be a small amount of loss of parts. LEGO elements are small and it is just a fact of life that some of them might end up in the vacuum cleaner. Luckily, you can buy spare elements online and at the end of each year teachers look over their stock, see they are a bit low on a particular element, and order some replacements. Another, less popular option is the ‘minimal kit’ storage. The modular construction approach of LEGO is fantastic when you are using it for the Design and Technology aspect of the Australian Curriculum, but if you are just focusing on the Digital Technologies aspect, often the build of the robot is not as important. In these cases, it is possible to have only the parts necessary for a simple robot design in one place. After students build this standard robot, there are no remaining parts left in the container which reduces the temptation to fiddle around with spare LEGO. It also means that more time can be devoted to the programming side of robotics. Once kits are sorted, they then need to be stored. The most common form of storage in schools is either locked cabinets or drawers. These are easy to install and if they have variable height shelving, they can be customised to neatly fit the storage containers. Another option is storage trolleys. The storage trolleys from MTA are on wheels, which allows them to be easily moved between classrooms and back to locked storage rooms for security. There are several different sizes to accommodate different numbers of kits. At the end of the day, there is a wide variety of options and no single solution will fit every school. The key thing to remember, is to find a system that enables your students to find the parts they need, with as little distraction as possible. I’d love to hear from you. What works well for your setup? We’d love to hear from you. What works well for your setup? Dr Damien Kee is an independent technology education expert, who specialises in bringing technology concepts to teachers and educators around the world. Ranging from Robotics to Electronics to Programming, Damien works to educate teachers on the benefits and relative ease with which technology can be embedded into their daily classroom activities. Damien can be found anywhere from sitting on the floor of a classroom, working with young students first learning the intricacies of programming, through to presenting at conferences to some of the most skilled educators in the field. He is the author of several popular Teacher Resource books and has worked with The LEGO Group on the documentation project for the EV3 Mindstorms product. Damien received his Bachelor of Engineering (Electrical/ Mechatronics) in 2001 and his PhD (Robotics) in 2007 from the University of Queensland. Thanks for the article. 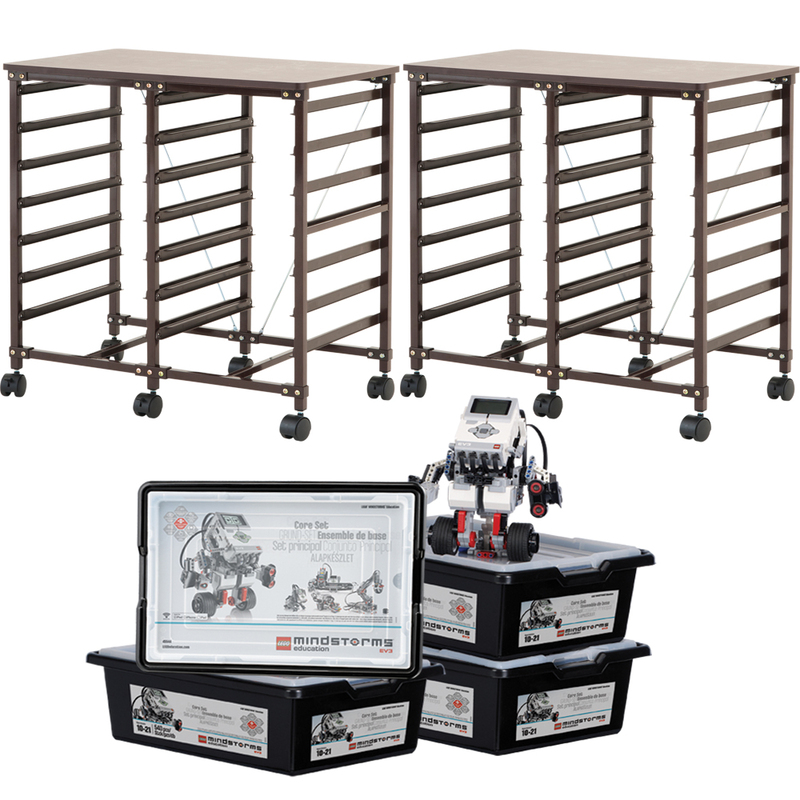 Our Robot club has 6 core kits and 6 expansion kits. And the end of the year is chaos. We were trying to keep the kits stocked as they came from the factory but that requires between 40-80 man hours of labor. The good thing about this method is that you can identify the missing parts and purchase exactly what you need. We are discussing switching over to the part based method, but it has been difficult to identify the most effective, optimal way to store and operate using this method. Do we make a compartment for every different type of part? 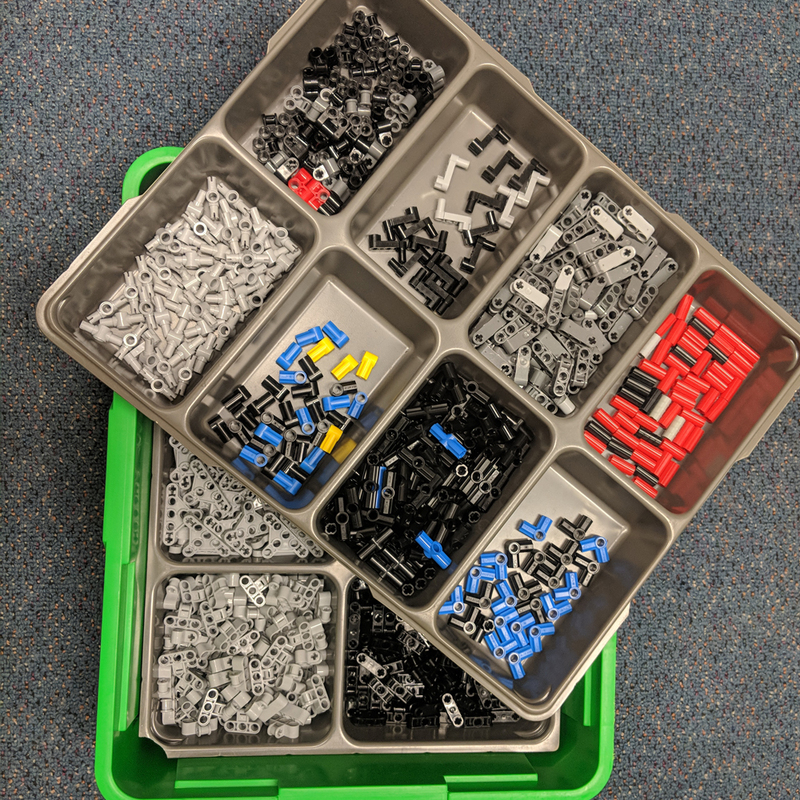 Or do we store similar parts together, (e.g keep all the 3x beams in one bin, regardless of color and keep all the grey and black connectors in one bin?) This would mean the ‘village’ would need to come to the ‘community well’ for parts. This seems like it would be a hindrance to creativity if you have multiple groups in your club. Regardless of the method, at the end of the year, you will still need to go back and ‘clean up’ the chaotic mess the students create over the year. Any feedback would be appreciated. Hi, thanks for the comment. As you’ve discovered, keeping the kits in factory default states takes a *huge* amount of work. 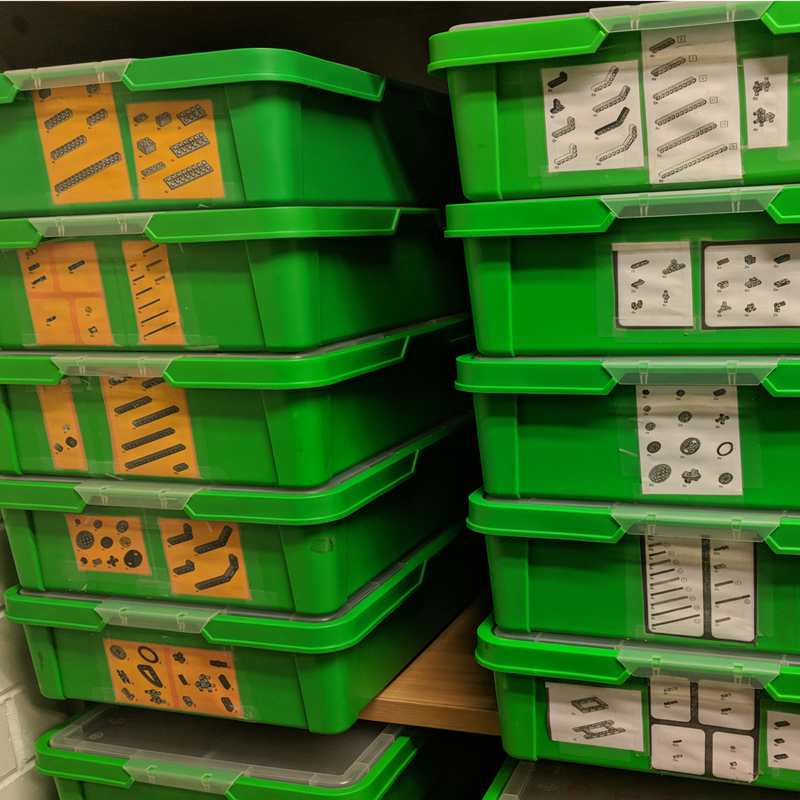 Give the vast majority of projects don’t require a set-in-concrete parts list, I find that even if you are missing a piece here and there, students use some engineering thinking to work around it, and the 40hrs+ of sorting is not worth it. As for sorting by part, it will depend on how granular you want to go. I’ve seen some setups where every different piece has it’s own bucket. Personally I think this is a little overkill. I much prefer to group them by function. ie. A bucket which has all the straight beams (5/7/9/11/15 long altogether). Another bucket might hold all the gears (8tooth/12/24/40 altogether). Yet another bucket might have all the different types of connector pins etc. 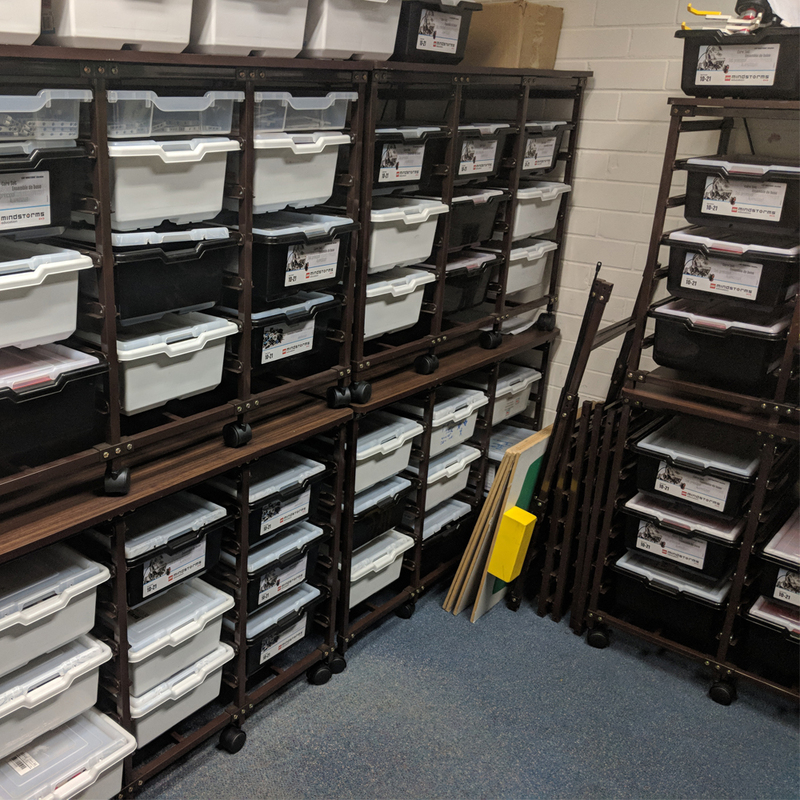 Yes it does means that students all need to come to the same place for their parts, but you can space out the buckets throughout the room to stop a mad rush to grab parts. I find it also enhances creativity as student often need “xyz” part, and if kits are kept factory sorted, they might not have a spare “xyz” to use. With all the parts sorted by function, the are free to grab that extra “xyz” to complete their creations. Hope this makes sense and helps you out!